AMONGST the prized blooms that have both commercial as well as ornamental value is the elegant carnation. Gardeners are usually not fully aware of the techniques of growing carnations. Their cultivation requires certain specifications. Carnations are suitable for bed planting, borders, rock gardens or even for pots. These are available in many hues and colors like red, crimson, orange, lavender, lemon, pink, cherry, white, cream etc. Besides, some commercial growers dye the white blooms to get tinted flowers. There are single and double blooms in various combinations and also stripes. 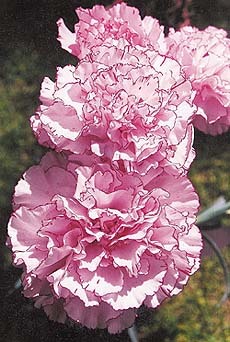 Another eyecatching characteristic of carnations is the frilled edges of some varieties. The plants are propagated through cuttings taken from the terminal growth. Four to six inches long cuttings are taken and the basal leaves of at least two to three nodes are removed. The cuttings are then inserted in pure sand. The lower leaves must not touch the surface. Cuttings become ready for transplanting in 25 to 30 days. Soil and irrigation are very important aspects of growing carnations. On these two factors rests the quality of bloom. The soil, as for other winter annuals, should be deep friable and sandy loam. The carnations do not take to heavy soils or water-logging. A soil rich in manure or ‘well-fed with nitrogen’ is not suited to the carnation. It may cause heavy vegetative growth, fewer blooms or even lead to the splitting of the calyx (green cup-like structure that holds the petals). The manure is to be mixed deep into the soil and at no time mulching (dressing) is to be done with the manure. At the time of preparation of soil, superphosphate and muriate of potash are added at 100 gram and 20 gram, respectively, per square metre of bed area. CAN at 50 gram per square metre is applied while preparing the bed and a similar dose a month later. Those who grow carnations know how important it is to carry out the pinching, stopping and disbudding. In case of the spray-type free flowering carnations, the plant is pinched at the six-node (the swollen part where the leaf pair emerges) stage. At that time it is about six inches tall. This type of removal or cutting of the main stem encourages emergence of lateral stems that are again pinched at the terminal. The more the number of terminals, the more the number of blooms one gets. These operations should be done right in the beginning as repeated pinching may delay flowering. The plants should also be staked in the beginning to get straight growth. In case fewer blooms are required, the plant is pinched once when it is about six inches high, and then later when the lateral shoots are four to six inches long, which is about four weeks after the first pinching. Some gardeners pinch half of the lateral shoots in a similar manner so that two flowering flushes are obtained. A heavy flush at a shorter period is not desirable. Once planted in a flower bed the carnation should be irrigated every five to seven days. In a pot, the frequency should be three to five days. At the time of plucking the carnations leave three to four nodes at the base and remove the stem. In case of spray carnations, the inflorescence should be removed when two to three upper flowers are open. Carnations have the capacity to withstand transportation exposure and recover after these are put in water.